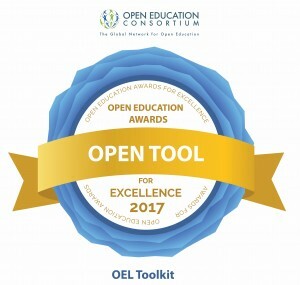 We are excited to announce that our Open Education Licensing Toolkit has been awarded one of the 2017 Awards for Open Education Excellence by the Open Education Consortium global network. It is a great honour to receive this award alongside teams from all over the world working in open education. Our team member Carina Bossu was in Cape Town, South Africa last week to accept the award on behalf of the OEL Project team at the OEC Global Conference. The Open Education Consortium is a non-profit, social benefit organisation made up of individuals, educational institutions and organisations that support the development of Open Education. Their mission is to promote, support and advance openness in education around the world. The Open Education Consortium global conference is held every year. The conference brings together administrators, policy makers, faculty, students, researchers and other professionals who all share an interested in helping Open Education shape the future of education worldwide. The OEL project team are delighted to receive this award, particularly in a new category that recognises the need for resources outside of the customary open courses and sites. We hope the Open Tools category will be one that develops in future years. If you are not familiar with the Open Education Consortium, we recommend you have a look around their site, which has some great information. The OEL project team is currently developing an Open Education Licensing Toolkit for use by the Australian Higher Education sector. The toolkit design is based on information from a survey, conducted in 2015, of individual managers, policy makers, educators, educational content developers and information professionals at Australian universities with an interest in Open Educational Resources and Open Educational Practices. The toolkit will help staff at Higher Education institutions who are developing online educational resources match open licensing decisions to the educational and business strategies of their organisation. They then follow a guided decision tree path, answering questions about their plans for the development or use of the OER resource. As they progress through the pathway this generates an individualised selection of snippets of information about open licensing that are relevant to that user’s specific needs. The information is provided in plain language with links to authoritative external sources. As part of the toolkit development the OEL team held a series of practical workshops with stakeholders around Australia from July to October 2016, to test the toolkit content and interface. Participants in the workshops provided valuable input into the further development of the toolkit. Assistance with the workshops was kindly provided by Curtin University in Perth, Queensland University of Technology in Brisbane and the University of New South Wales in Sydney, who we’d like to thank for their assistance with the project. Development of the toolkit is continuing and the team is currently planning to have it available online from late November 2016. The toolkit will be accessible from www.oel.edu.au. As part of the research process for the OEL Project, we have reviewed intellectual property policies of Australian Universities to understand what rights they give to employees over the teaching materials that they develop during the course of their duties. In general, the intellectual property policies of Australian universities have been much more concerned with the commercial potential of research outcomes, with little attention given to teaching resources. The majority of universities retain ownership of these resources, some provide rights to staff through a licence, and a few grant copyright to the staff creating the resource. Without copyright ownership, or at least an explicit licence, teachers who would share their resources as open educational resources must either work outside of formal permission or seek permission outside of the intellectual policy framework if they wish to share teaching resources. The responses to the OEL Project survey suggested that at least half of respondents shared resources freely outside their institutions, though it is possible that these individuals are working in institutions which grant them that right. For institutions who are considering adopting more OER friendly policies, the OER Policy Development Tool, from Lumen Learning allows users to simply check boxes to create a draft policy document. 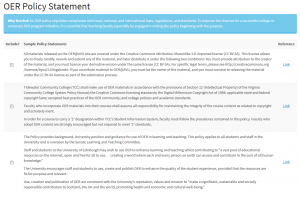 By selecting and adding components from different sections users create a policy document which which adheres to their vision of what OER should be at their institution. Individual policy components are drawn from existing policy documents and are linked for users who wish to view the component in context. Perhaps it is unlikely that an Australian University will adopt a policy developed by selecting components, but this tool allows the decision making around policy setting related to OER to be clearly considered and draft policies representing different levels of commitment to open practices to be developed quickly and simply, and to be based on good practice from other institutions. Our Research page has been updated and now contains more information about recent developments in the OEL project, including about our survey results, toolkit development, and dissemination plans. Analysis of the survey data and information gained from follow up interviews have now been incorporated into specifications for the OEL Toolkit. The finished toolkit will provide a naviagational structure for accessing information on OER licensing in the Australian higher education sector. 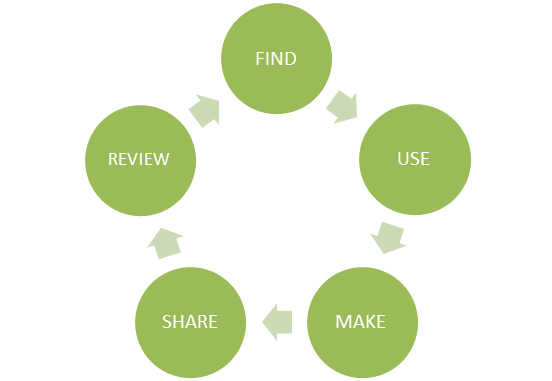 By identifying the needs of academic and professional staff working with OER licensing, the toolkit will provide access to valuable, practical advice starting from the five nodes of the OER lifecycle: finding, using, making, sharing, and reviewing. Staff from the Tasmanian Institute of Learning and Teaching (TILT), at the University of Tasmania, are currently well underway with the technical development of the toolkit. To gather input as the toolkit develops, we are holding a series of stakeholder workshops to demonstrate and seek critical input on the toolkit. The first workshop was held at Curtin university in Perth on 7 July 2016. Feedback from workshop participants will be used to refine the technical and informational aspects of the toolkit. The coming months will see further workshops around Australia, where more developed versions of the toolkit will be demonstrated. A consortium of investors including the Bill and Melinda gates Foundation and the William and Flora Hewlett Foundation have provided $US9.8 million dollars for a major initiative to create a library of open educational resources developed for a grouping of 38 community colleges but available to anybody to adopt, reuse, and repurpose. This kind of initiative is exciting because although there are often culturally specific aspects of educational resources which may require further work before they can be adopted internationally, they are freely available and come with permission to do that, or any other kind of repurposing meaning that the impact will be far larger than just the US community colleges who wil benefit most immediately. The direct benefits for students with limited financial resources are easy to quantify, for every course that is based solely on OER the cost of a text book can be deducted from the budget required to participate fully in that course. The ongoing and broader benefits of making a high quality and coherent collection of resources available freely are perhaps harder to measure but probably more important. Unlike funding for textbooks these resources will have multiple and can assist in delivering better educational outcomes globally.